It was great working with Eric! I would totally hire him again. 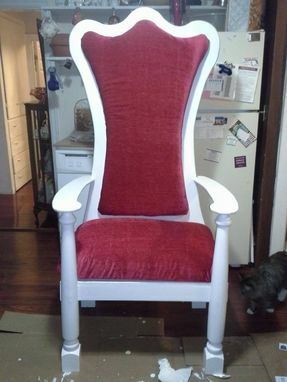 This throne was commissioned for a company Christmas party. 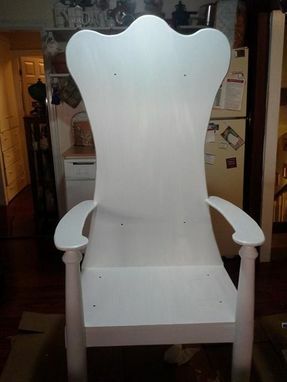 The chair was based loosely on a similar one previously used by the company but was heavily reinforced to ensure that it can be used for many years to come. It is constructed from two sheets of plywood and the legs are braced with white oak for additional strength. The upholstery is designed so it can be removed for easier maintenance and storage. 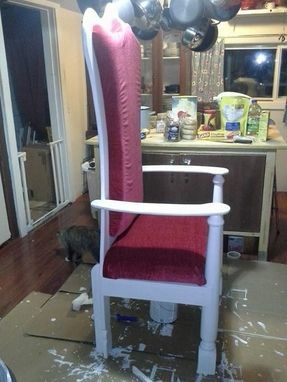 In the event that the cloth is damaged it can be replaced without needing to take the entire throne to an upholsterer. The chair is 66 inches tall, 30 inches wide, 20 inches deep, and the seat is 20 inches from the floor. Every maker has a story. Be a part of Emerald City Crafts's story by placing an order, leaving a review, and seeing your review appear here.